One bedroom apartment, one king size bed and one large convertible sofa-bed, Jacuzzi for two, in-room safe, computer with Internet, kitchen with cooktop, microwave and fridge,washer and dryer, 2 LCD TVs with Satellite channels, balcony with the view of City Garden. Honeymoon suite? Royal suite? Lili Apartments are glorious mix of opulence, elegance and comfort, fit for Prince William and his bride. You deserve no less. White marble on the entrance floor invites you to enter this dream of light, white Italian luxury, with brocade curtains, crystal chandeliers on the ceiling and gorgeous super comfortable bed in the bedroom. This classic old world luxury comes together with such super modern facilities as two TVs with satellite channels, computer with wireless internet, Jacuzzi bath and fully equipped kitchen with stove, fridge and microwave. If you really, really have to bring kids, the sofa in the spacious living room opens into the comfortable bed suitable for two. This sofa could easily accommodate one couple as well. The kitchen has everything you need for making gourmet meals, but why bother? The hotel is situated on the popular Deribasovskaya Street, full of bars and restaurants, such as Steak House and Mick O'Neill's Irish Bar. There is something for every taste. 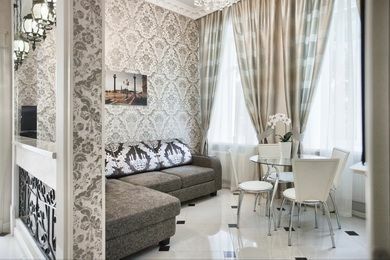 Your Lily Apartment is your base for exploring old Odessa, its white sand beaches on the Black Sea, beautiful parks and 18th century architecture. $80 per night if you book for 10 nights or more.